FRANKFURT MUSIKMESSE 2010 PRESS RELEASE: In mid-January at the NAMM show, Hercules offered a sneak preview of its latest DJ controller. Today, at the Musikmesse European trade fair in Frankfurt, the manufacturer is pleased to announce the release date and retail price of its new Hercules DJ Console Mk4. Mark this down on your calendar! 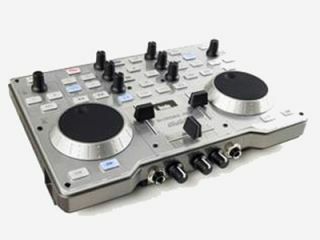 This 2-deck portable DJ controller, featuring built-in audio, will be available in June 2010, at a suggested retail price of £179.99. The Hercules DJ Console Mk4 is the most portable and most compact 2-deck DJ controller with built-in audio for PC and Mac®: just 26.5 x 18.7cm in size (10.4" x 7.3") and weighing in at a mere 1.15kg (3.3lb), DJ Console Mk4 is the ideal controller for mobile DJs, wherever they are mixing. In addition to its 2 stereo outputs (one for mixing, the other for previewing tracks), the Hercules DJ Console Mk4 also features 2 stereo audio inputs - unique in this product category - to connect any analog audio sources. It integrates perfectly into a DJ's environment, whether he/she is just starting out or at a professional level. · Switch between mixing on their computer and mixing with standard DJ decks (CD or vinyl): using DJ Console Mk4 and the included VirtualDJ® software, DJs can manipulate external audio sources just as they would with an analog mixing setup (the cross fader, volume faders and EQ knobs control mixing between the two external decks). To check out the new Hercules DJ Console Mk4 for yourself, visit us at the Musikmesse in Frankfurt, Germany, from March 24-28, 2010, at booth C44 (Hall 5.1) - the booth for Hercules/Hyperactive, its distributor in Germany. - 2-deck mixer: mix digital audio files on PC and Mac®. - The console features a compact design, powered by the USB port, and has been created for mobile DJing. · 2 stereo outputs to play the mix on active speakers, a PA system, a hi-fi system or a mixer. · 2 stereo inputs (with 4 levels: Phono / standard line level / professional line level / boosted line level) to connect any external audio sources: MP3 players, CD mixing decks, vinyl turntables and more. · Headphone output (for previewing tracks). · Microphone input (with talk-over function). Well-spaced controls for precise mixing: 2 jog wheels, one cross fader, 2 volume faders, 2 pitch encoder knobs, 6 EQ knobs and 36 buttons. - Intuitive to use: includes functions for synchronizing tracks, automatic loops, adding multiple effects, and recording mixes. - Includes the VirtualDJ® DJC Edition mixing software. -Comes with a protective cover, a shoulder strap for easy transportation, and a sub-skin featuring a printed graphic (which can be placed underneath the rigid transparent skin installed on its top panel, to customize the console with an eye-catching design).